This is the authentic Pokemon Yellow Special Pikachu Edition Game Boy Game cartridge. A new battery has been installed and the games is cleaned, tested, and guaranteed to work and save! Discover the world of Pokemon. With Pikachu as the main Pokemon you play the Pokemon trainer in a quest of collecting and training all 151 Pokemon. 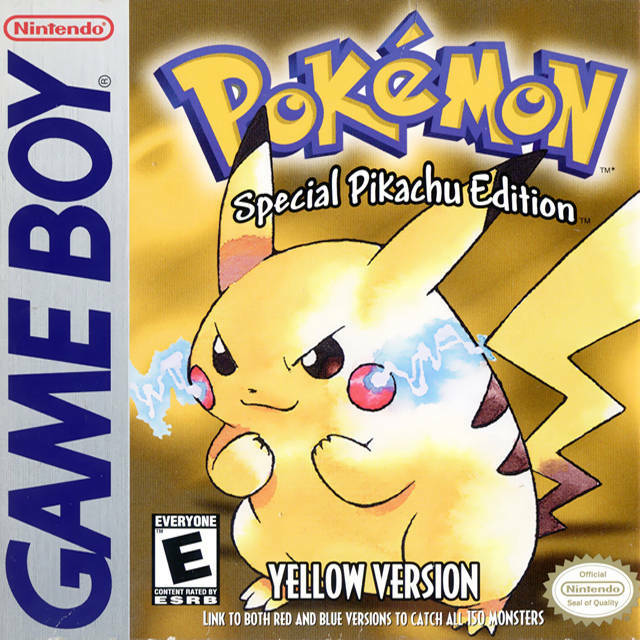 Throw the Pokeball at the Pokemon to own it or trade it with other players via the Game Link Cable. This game works on the original Game Boy, Pocket, Color, Game Boy Advance, and Advance SP systems. It does not work with the Micro or any kind of Nintendo DS. The product was as described used but in excellent conditions and also Fast shipping . Thought I would never get a chance to play this game again... Lukie games has pulled through! Great condition new battery in game for saves 34 hrs into game and no issues. Thanks Lukie games I have a piece of my childhood back! Games saves fine and works perfectly! Got here before I expected it to! They once again do not disappoint. Game was in excellent condition with no visible wear at all on the cartridge and the sticker/art was fully intact. Game saves as well so no battery needs to be replaced. Awesome all around. Product came exactly as advertised and works just like it should. I have put over 20 hrs into the game and have encountered zero issues. Ordered the game from Edmonton, Canada. Took more than 2 weeks but arrived in under 4 weeks. Game came in good condition with regular wear from usage over the years. My only concern is that I have to change the battery so I can save the game. I assumed that Lukie Games changed all the batteries before putting games out for sale. The game arrived on time and is in excellent condition. Very minor fading on label art. Game saves like new and trades between the other games. This was a steal at the price and quality. Especially with a new battery installed. Love Lukie. Always order used from here and nowhere else. AMAZING!!! EVER SINCE I HEARD THIS GAME EXISTED I WAS LIKE BUY BUY BUY BUY! IT WORKS LIKE NEW AND HAS NO SAVE DATA! THANK YOU LUKIE GAMES! Pokémon Yellow was a great game. My copy was in nice condition. Also, it will go great with Red and Blue. I played this all the time as a kid!! Thank you Lukie Games for bringing such greatness back into my life!! The game looked and played like New!! !